"Biryani " is a mixed rice dish with spices, rice, meat or vegetables. Though biryani is originated in Persia, it is more popular in malabar areas in Kerala. 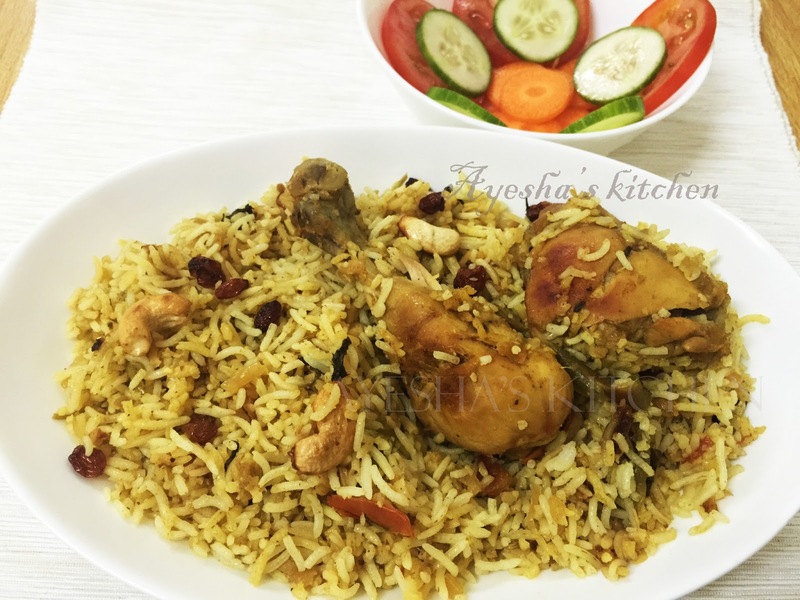 Malabar Chicken dum biryani is always something very special as it is made with a special rice called khaima. Here am sharing a special chicken fried Dum biryani. For this you can either deep fry or shallow fry the chicken, then mixed with the gravy / masala and finally the dum process which makes the biryani heavenly taste. Marinate the chicken with all the ingredients , given under marination. Keep it refrigerated for half an hour. Now the next step is boiling the rice . So take a vessel and boil water (more than double the amount of rice). Put chopped carrot, cinnamon, cardamom, cloves . When the water starts boiling, put some curry leaves and add enough salt. Now put the cleaned rice to it . When the water starts boiling , add vinegar and 1 tbsp oil to it and close the lid. Cook till the rice is 90 % done. Now drain the water in the rice and keep it aside. Mean while you can fry the chicken. You can either deep fry the marinated chicken or can shallow fry. I shallow fried the chicken with less oil. When done, drain oil and set aside. Again take a vessel and heat ghee. Add the garam masala's and add onion. Saute onion till brown and then add tomatoes, ginger garlic paste and green chilies. The onion must be cooked well. Saute well, when done add coriander powder, turmeric powder, garam masala powder, salt, curd and then chopped coriander leaves , mint leaves, curry leaves. Mix very well and let it cook with lid open. Cook until a smooth and thick gravy consistency. Check for salt. Now add shallow fried chicken. Mix well. Make the flame to medium low. Now drop some boiled rice over the masala, then spread chopped coriander leaves, fried onions and some drops of ghee. Again layer the rice and repeat it. This process is called Dum. Finally garnish with coriander leaves, fried onion and spread some ghee on the top evenly. Close the lid tightly and can keep some weight over the vessel (optional) . Or can close all the ends of the vessels with maida dough. Allow it to cook in very low flame for 10 minutes. While serving garnish with fried cashews ,raisins and fried onions.